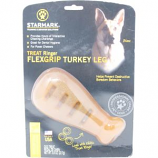 StarMark Pet Products are created and developed by the Certified Training and Behavior Specialists at Triple Crown Dog Academy, Inc. to reflect the way dogs learn and have fun. 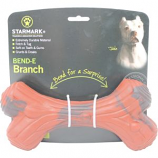 Utilizing the expertise gained through working with thousands of dogs and their owners, StarMark creates interactive behavior products, dog training gear, step-by-step training guides, video dog training lessons, training and behavior solutions, and other educational materials. 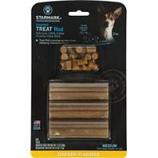 Unique design to insert interactive treats inside - crunches as dog chews releasing treats. 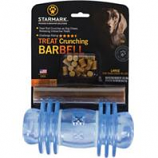 Works with starmark treat crunching toys. . . . 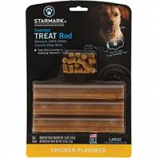 Holds inserted treat rod inside plus interactive treats. Provides hours of challenging play. Made with virtually indestructible material. . . Provides hours of interactive chewing challenge. Great for dental hygiene. 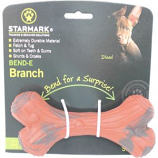 For power chewers. 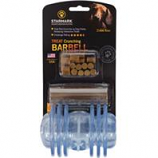 Load with edible treat rings. . Extremely durable material. Fetch and tug. Soft on teeth and gums. Grunts and Croaks. .